From above view of multiracial beautiful women wearing bikini and chilling on sand getting suntan and talking in relaxation. 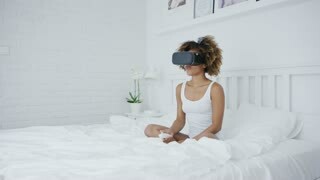 Ethnic model wearing VR headset and using gamepad while chilling on bed in morning time and playing game in alternative world. Young content model in bikini swimming in cool resort pool and typing on laptop while chilling alone on vacation in bright sunlight. Beautiful confident blonde wearing black bikini and chilling in tropical resort pool using smartphone and headphones on background of blue water. Portrait of young attractive woman posing in bright bikini and looking at camera in stylish sunglasses while chilling in pol of tropical resort. Pretty brunette in sportswear chilling on meadow in park wearing headphones and using smartphone for online conversation. Content diverse women wearing bikini and chilling together on sandy shoreline of tropical ocean chatting in fun.